Todd Gurley is an NFL running back who currently plays for the league’s Los Angeles Rams which drafted him as the 10th overall pick in the 2015 NFL Draft. He rushed for 1,106 yards in his rookie season and earned the Associated Press Offensive Rookie of the Year. Before playing professionally with the NFL, Gurley played college football at Georgia. Todd was born in Baltimore, Maryland on the 3rd of August 1994 to Darlene Simmons and Todd Gerome Gurley. He attended Tarboro High School, Tarboro, North Carolina, where he played football, basketball and also participated in track events. He played for the school’s football team, both as a running back and a defensive back. During his junior season, he recorded a total of 1,472 rushing yards, seventy-nine (79) tackles, one interception, a forced fumble and twenty-six (26) touchdowns. Todd Gurley was named an All-Area Offensive Player of the Year for the 2010 season by Rocky Mount Telegram. As a senior, he also won the Associated Press Player of the Year award after totaling 2,600 yards and thirty-eight touchdowns. Rivals.com considered him a 4-star recruit after he was listed 5th best RB in his class. Gurley would later commit to the University of Georgia to play college football under Mark Richt, the then head coach. He began his first year serving as a backup to Ken Malcome but after an impressive first game against Buffalo Bulls, where he rushed for 100 yards on 8 carries with 2 touchdowns and a home victory where he recorded a 100-yard kickoff return for a touchdown, Todd Gurley was named the starter for the second game where he rushed for sixty-five yards on ten carries. He ended that season starting twelve of the fourteen games he played and rushing a total of 1,385 yards on 222 carries with seventeen touchdowns. Todd became the second true freshman in the history of Georgia to rush for 1,000 yards. At the end of the season, he was named First-Team All-SEC by the Associated Press. The following season (2013), he played ten games, rushed for 989 yards on one hundred and sixty-five carries with ten touchdowns, After the season, the Associated Press named him the Second-Team All-SEC. In 2014, Todd was suspended by the school authorities for violating NCAA rules and later received a four-game ban after investigations revealed he has made $3,000 in 2 years from signing memorabilia and autographs. In his first game after suspension, he tore his ACL during in the against Auburn. The injury ended his junior season as well as his college career at Georgia, as he decided to forgo his senior season for the 2015 NFL Draft. Todd Gurley was selected tenth overall pick by St. Louis Rams in the first round of the 2015 NFL Draft. He was the first running back RB to be selected in that year’s draft and the lad got off to a good start. He finished his rookie season with 1,106 rushing yards, 10 touchdowns on 229 attempts at the end of the season, he was ranked on the NFL Top 100 Players of 2016 by his fellow players. 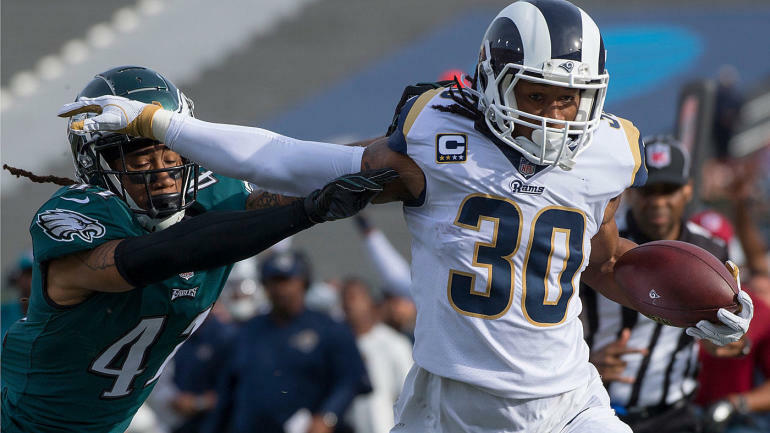 Gurley struggled the following season to maintain the records he made in his rookie season, but he still experienced a decline with just 885 yards, making him the 17th in the league, 55.3 yards per game, 6 touchdowns. He, however, made up for this records the following season, with 114 points, Todd led the league in scoring among non-kickers. He became the 16th player in the history of the NFL to record a 750/750 rushing/receiving yards in a season and the 8th at 1300/750. In addition to winning the NFC Offensive Player of the Week for the two straight weeks and the NFC Offensive Player of the Month twice that month, Toddy was named the NFL Offensive Player of the Year. In April 2018, he signed a five-year contract extension with the Rams worth $60 million, with $45 million as guaranteed money. He is currently the highest-paid RB in the NFL. Gurley is not married but has a steaming hot girlfriend that goes by the name of Olivia Davison, the duo has been together for some years now beginning in 2014. Olivia owes an online clothing and accessory shop called Liv Lively. The RB stands at the height of 6 ft 1 in (1.85 m) and weighs 102 kg (224 lb). His arm length is 31 1/2″ and his hand size is 10″.